I actually thought I couldn’t take any photo for the recent photo challenge with the motto Off-Season. But we have still very mixed weather in Northern Germany, it’s actually not really summer weather except for some good days. Yesterday we had a good day, a friend came to visit and asked me if I would like to drive to the beach and I thought the idea would be great. The weather was perfect when we started, but as soon as we arrived, the weather changed from summer to autumn and it began to rain. 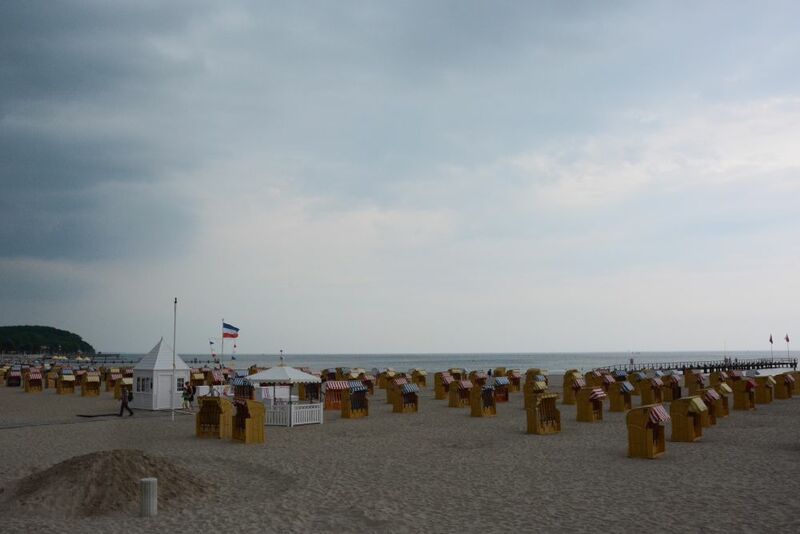 In the photo above you see the Travemünde beach before the rain started, it looked already dark and not like a summer day, that’s what I would call Off-Season. Are those covered beach chairs in the photo? I have not seen those here in America. I also wonder why they are not facing the water. Yes, these chairs are very common on the baltic sea but also on the other side of our federal state, on the north sea. You might even find them in Denmark and Netherlands on the beaches. You make a good point, they do usually face the water. I think the season starts late, we had just a few real hot summer days, apart from that it is either rainy or very cold. I wouldn’t go bathe now as the water is probably not warmed up enough yet to enjoy it, unless you want a cold bath which can be fun too for some minutes. That is of course very strange considering that we already have June. This is the only reason I could image why the chairs are still closed and not facing the water. My friend asked the same yesterday and we could only come up with this theory. I can not await until the weather stays good, I would like to have some fun beach days again. I grew up near Chicago but moved to Florida in 1988. Since then I have become accustomed to the warm weather and can no longer tolerate cold water. I went to the beach here in Clearwater last weekend and the water was almost too cold for me. At least it was at first but I quickly got used to it. I just know Florida from documentary and pictures or YouTube, but the water looks so much more beautiful in Florida. Also I love the beaches with the palms and so. Wow, I love those little cabana chairs, they’re lovely, and not something I’ve seen before. Great photo. They are very common here on the German coast 🙂 People rent them, but they are expensive to rent… I usually prefer my towel 😀 But true, they look great.